Nepal has ordered a new measurement of Mount Everest to determine exactly how high the world's highest mountain is. The Himalayan country has continued to recognize the decades-old measurement of 29,028 feet (8,448 meters) though Western climbers and China have made new claims. The government decided last week during its annual budget speech to take the new measurement, Land Reforms Ministry spokesman Gopal Giri said Wednesday. The plans are being formed this week and the work will take two years. It will entail placing a device on the peak that will measure the height using satellite technology, he said. Stations will be set up in three locations using the global positioning system. An American expedition in 1999 said it used GPS satellites to determine the peak to be 29,035 feet (8,850 meters), a height which is widely used now. 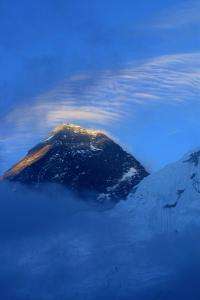 China, which is straddled by Everest's northern slopes, says the peak is 29,008 feet (8,844 meters) high. Everest has been climbed by thousands of people since it was first conquered by New Zealander Edmund Hillary and Sherpa Tenzing Norgay in 1953.